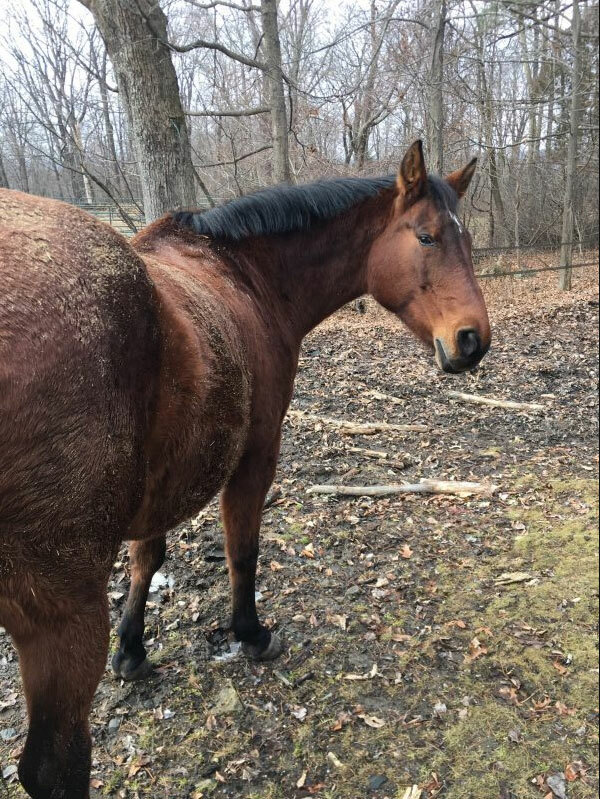 Typically in the colder months when it is not convenient to bathe my horse Bug, I often show up to the barn and look in her paddock to find a horse very proud of how much mud that she has successfully applied to her body. I see this beautiful creature looking as though she is at a spa, getting a mud mask treatment to her whole body. Every day, she is coated from head to tail in mud, dust, shavings, hay, even leaves! Yes, every day. Bug loves to be groomed almost as much as she likes to roll and be coated in dirt! Bug is not naturally a very spooky horse, but I still introduced her to my giant shop vac slowly and she adapted to it well. In the past few years, I upgraded to a smaller quieter shop vac and eventually a Vac’N Blo. Bug truly enjoys being vacuumed and I enjoy how clean she looks in so much less time! Take these steps to groom your horse with the assistance of a vacuum. Step 1: Use a shedding blade to remove major debris and clumps of mud from your horse’s coat. Step 2: Use your favorite curry to loosen any remaining dirt and bring any hidden dirt to the surface. Step 3: Use a dandy brush to remove most of the visible dirt. Step 4: If your horse has never been exposed to a vacuum, take some time to turn it on and gauge your horse’s reaction. It can also be beneficial to get them used to the hose and vacuum attachments while the vacuum is off also. Step 5: Use your vacuum to remove the dust and debris from your horses entire coat. You can vacuum with and against the hair to remove as much dust and dirt as possible. Step 6: If there is any lingering dust use a damp towel to remove it and then use your favorite coat conditioning spray on your horse’s clean coat. Step 7: Pat yourself on the back! Your horse is now clean and fresh. Be sure to enjoy this phenomenon now, because if your horse is anything like Bug it won’t last long!